This month, we're pleased to invite you to join our new community of ethics and compliance leaders. We are thrilled to announce that LRN is launching a new community of ethics and compliance leaders for you, our valued Partner, called the Principled Leadership Collective (PLC). Designed to elevate the conversation on ethics and compliance, the PLC provides an opportunity for Partners to learn from other industry professionals and share their own expertise while inspiring principled performance. This program will contain a variety of resources including our upcoming Principled podcast, speaking and panel opportunities, and more. To learn more about the PLC, take a look at our microsite. We'd also like to share this formal note from LRN's Marsha Ershaghi Hames personally inviting you to join the collective. Launching this month, LRN’s new Principled podcast will bring together the collective wisdom on ethics, business and compliance, transformative stories of leadership and inspiring workplace culture. Listen in as we discuss the progression of the ethics and compliance industry and learn strategies and receive actionable advice from our community of business leaders and workplace changemakers. 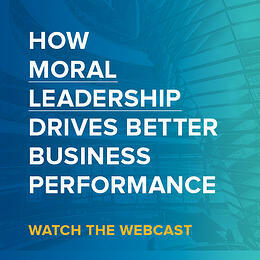 Our latest on-demand webcast, How Moral Leadership Drives Better Business Performance reviews key findings from our Moral Leadership Report. LRN's Emily Miner and GCL's Jan Stanley explain how leading with moral authority can lift individual and organizational performance. Learn how moral leadership is defined, seven best practices, what happens when moral leadership is missing and much more. LRN's recently published annual report focuses on how high-impact programs operationalize best practices in the workplace. Nearly 500 ethics, compliance, legal experts and practitioners around the world were surveyed and we discovered that organizations that embrace their values by embedding E&C programs in their business outperform in workplace effectiveness. LRN CEO, Dov Seidman and other leaders answer questions about instilling trust in relation to artificial intelligence. 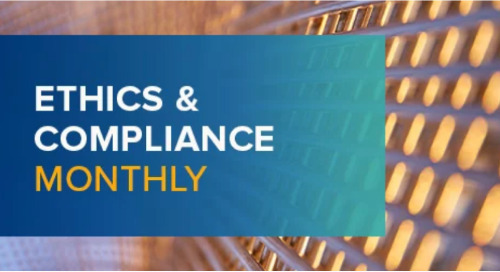 Findings from LRN's 2019 State of Moral Leadership in Business Report were featured in this Compliance Week article. LRN's Ben DiPietro shares his perspective on how advancing artificial intelligence and machine learning presents a source of competitive advantage for people. LRN's Danielle Schlar shares how she redefines human resources as a critical business function and strives to reshape the company's relationship with human resources. 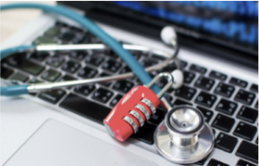 Did you know that Certification Manager provides an escalation workflow process to address disclosures that may put your organization at risk? -Create customizable, stand-alone registry/disclosures in 67 different languages. 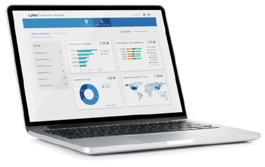 -Automate the process of obtaining employee and third-party disclosures. Don't be a stranger and come say hello to LRN at the events below! Operationalizing E&C programs instead of relying on checklists optimizes impact. 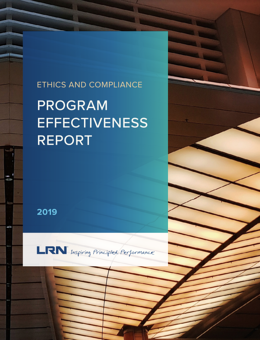 Learn more from this infographic that highlights the results of LRN's 2019 E&C Program Effectiveness Report.